Takayasu arteritis (TA) affects aorta and its branches, sometimes coronary and pulmonary arteries. TA is a chronic process progressive in nature with underlying inflammation of affected arteries. We report two cases with this multivessel arteritis, one of them with a valvular involvement; and their management in pregnancy. TA is a large vessel vasculitis, primarily involving aorta and branches in the head, neck, upper and lower limbs. As the disease is more common in women of child-bearing age, adverse pregnancy outcome is a common phenomenon. Hence such pregnancies need multidisciplinary management. Here are two cases with aortoarteritis with successful antepartum and intrapartum management. A thirty year old primigravida came for antenatal registration in late first trimester. She was a known case of aortoarteritis, which was diagnosed 15 years ago when she had acute left sided chest pain and was detected to have high blood pressure of 160/100 mm of Hg. Computerized tomographic aortogram at that time showed left subclavian and renal artery stenosis, and left coronary artery disease. (Figure 1) She was advised coronary artery bypass grafting, but opted for medical management, and was discharged on prednisolone, atenolol, prazosin and aspirin. She took the medications for one month and stopped. Since her symptoms never recurred, she never followed up with the physicians. Figure 1. CT Angiogram with arrows showing areas of arterial narrowing. On examination, her vital parameters were normal except blood pressure of 140/90 mm Hg in the left upper arm and 120/80 mmHg in the right. All pulsations were well felt. In sitting positon, left sided neck pulsations were prominent. Her obstetric examination revealed uterine size corresponding to the period of gestation. Hemoglobin was 11 gm % and urine albumin was absent. Her aCLA IgG/IgM, anti- β 2 glycoprotein antibodies, ANA and anti-ds DNA were all negative. C Reactive Protein, Erythrocyte Sedimentation Rate and C3/C4 levels were all normal. Echocardiography showed ejection fraction of 60% with trivial mitral regurgitation. Subclavian artery doppler showed narrowing of left subclavian artery, but normal flow in all four limbs. She was then started on tablet prednisone 30 mg once a day with tapering doses, tablet labetalol 100 mg twice a day and nifedipine 20 mg once a day in consultation with cardiologist and rheumatologist. Blood pressure in left limb remained in the range of 150 to 140 / 90 mm Hg and in right limb 130 to 120/ 80 mm Hg. Her antenatal course was uneventful. At term, weekly non-stress tests were done and were reactive. Anesthetic review was done for epidural analgesia. In view of her stable condition, vaginal delivery was planned after counseling of the patient and her relatives. However, at term she went into spontaneous labor but cesarean section had to be done for brow presentation under epidural and spinal anesthesia. Postoperative course was uneventful, and anti-hypertensives were continued post-delivery. She was discharged on the fifth day, and she chose barrier method of contraception. She was asked to follow up with cardiologists and rheumatologists regularly. A twenty four year old primigravida, a diagnosed case of aortoarteritis, came for antenatal registration at 10 weeks of gestation. She was on regular follow up with nephrologist after being diagnosed with renal hypertension a year before. She had no history of chest pain, limb claudication or syncopal attacks. Systolic blood pressure difference in right and left arm was 20 mmHg. Systolic murmur was heard, and echocardiography showed rheumatic heart disease with moderate mitral regurgitation, mild tricuspid regurgitation, mild pulmonary hypertension and good biventricular function. Her hemoglobin was 12 gm % and urine albumin was absent. Liver and renal functions were normal with creatinine of 1.1 mg/ dl, 24 hr urine protein 267 mg, C3 and C4 were 95.6 and 26.7 respectively. Her aCLA, beta 2 gycoprotein, ANA and ds DNA were negative. However, lupus anticoagulant was weakly positive. Angiography done in non-pregnant state had shown infraceliac abdominal aortic narrowing upto infrarenal aorta, 5 cm in extent. Left renal artery was narrow with multiple tortuous collaterals. Rest of the aorta (aortic root, arch of aorta, thoracic aorta and infrarenal aorta) was normal. She was started on tab metaprolol 50 mg once a day, tablet aspirin 75 mg once a day and tablet labetalol 100 mg thrice a day. Later tablet alpha methyl dopa 250 mg thrice a day was added as the diastolic BP of both upper limbs rose to 110 mm Hg. Renal doppler study showed parvus tardus waveform in segmental and hilar renal arteries confirming bilateral renal artery stenosis. Her TSH was 15.86 U/ ml, for which tablet levothyroxine 75 mcg per day was started. Her antepartum course was uneventful. Obstetric sonography showed normal fetal growth with normal uterine artery doppler flow. Weekly non-stress tests were done and were reactive. She went into spontaneous labor at 39 weeks. Cesarean section was performed for breech presentation under epidural anesthesia. She delivered a female child of 2.67 kg with Apgar score of 9/10. Her postnatal period was uneventful. She was discharged on the sixth day with oral medications. She also chose barrier method of contraception and was asked to follow up with nephrologists regularly. Takayasu’s arteritis is an early onset granulomatous aortoarteritis with aortic inflammation also known as 'pulseless disease'. It leads to proximal occlusion and/ or aneurysms of aorta, carotid, subclavian, pulmonary, iliac, and renal arteries. Here, one patient had subclavian artery involvement and the other patient had renal artery involvement. Women in their second and third decades of life are predominantly affected. It is more common in the southeast Asian and Indian subcontinent regions than in the western population. The disease is characterized by an early inflammatory phase, in which there may be fever, arthralgias, weight loss, and a late occlusive or a pulseless phase. Its etiology remains primarily idiopathic. However, both our patients presented at a time when the diagnosis had been achieved prior. The first patient in this report was labeled as type V TA and the second as type IV TA as per the angiographic classification of Takayasu Arteritis. As proposed by Ishikawa et al, the disease can be classified into groups on basis of complications such as hypertension, retinopathy, aneurysms, and aortic insufficiency. [1,2] According to this classification, the first patient belonged to group II a and the 2nd to group III. Pregnancy may not affect disease progression but TA affects pregnancy in several ways like preterm labor, preeclampsia, intrauterine fetal growth restriction/ demise, and abruption. In a study by Gatto et al, 51.7% fetal growth restriction was reported. Other complications of TA are retinopathy, secondary hypertension, aortic regurgitation, and aneurysms. The disease process also causes reduction in elasticity and narrows arteries, impairs aortic and carotid baroreceptors function. Though diagnosis is based on clinical findings like decreased or absent pulses, unequal limb blood pressure and bruits, magnetic resonance angiography and fluoro-deoxy-glucose positron emission tomography can detect TA activity before the development of vascular compromise. In our second patient, TA was associated with rheumatic heart disease (RHD). Association of RHD and TA is rare. Though aortic valve involvement is more common, mitral and tricuspid valves may be involved in upto 20% without thickening. In a large autopsy study, there were very few cases on mitral involvement. Aortic valve involvement was more common. Management of TA involves a multidisciplinary approach aimed at mitigation of inflammation, treatment of complications, correction of stenotic lesions or even angioplasty when required. Preconceptional counseling includes dose adjustment or stopping cytotoxic drugs, and starting folic acid. Ideal time of pregnancy is during remission. Both our patients were in remission during conception. Early registration in tertiary care centre, regular antenatal visits with blood pressure monitoring, renal and cardiac monitoring and preeclampsia screening are vital in these patients. In our two cases, renal and cardiac involvement were present, and regular follow up with the specialists helped. Fetal surveillance is as crucial as tests for maternal well being. Our patients were monitored for fetal well being regularly using NST and obstetric sonography, which were normal at all stages. Though the preferred mode of delivery is vaginal, in stages IIb and III, cesarean section is preferred to avoid cardiac decompensation due to increased blood volume and blood pressure. Neuraxial blockade is preferred for analgesia in labor. Both our patients underwent cesarean section, for obstetric indications. Pregnancy with TA presents a challenge. Successful pregnancy outcome is possible with meticulous interdisciplinary management. Ishikawa K, Maetani S. Long-term outcome for 120 Japanese patients with Takayasu's disease: clinical and statistical analyses of related prognostic factors. Circulation. 1994; 90(4): 1855–60. Johnston S, Lock R, Gompels MM. Takasayu arteritis: a review. J Clin Pathol. 2002; 55(7): 481–6. Gatto M, Iaccarino L, Canova M, Zen M, Nalotto L, Ramonda R, et al. Pregnancy and vasculitis: a systematic review of the literature. Autoimmun Rev. 2012 May;11(6-7): A447-59. Leal P, Silveira F, Sadatsune E, Clivatti J, Yamashita A. Takayasus’s Arteritis in Pregnancy. Case Report and Literature Review. Revista Brasileira de Anestesiologia. 2011; 61(4): 479-85. Andrews J, Al-Nahhas A, Pennell DJ, Hossain MS, Davies KA, Haskard DO. Non-invasive imaging in the diagnosis and management of Takayasu’s arteritis. Ann Rheum Dis 2004; 63(8): 995–1000. Kinare SG. Cardiac lesions in non-specific aorto-arteritis. An autopsy study. Indian Heart J. 1994; 46(2): 65-9. 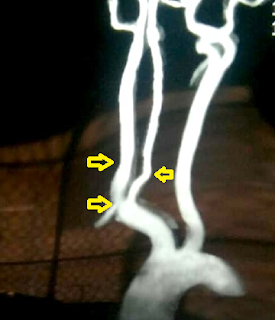 Marwah S, Rajput M, Mohindra R, Gaikwad HS, Sharma M, Topden SR. Takayasu’s Arteritis in Pregnancy: A Rare Case Report from a Tertiary Care Infirmary in India. Case Reports in Obstetrics and Gynecology. 2017:2403451. doi: 10.1155/2017/2403451. Papandony M, Brady S, Aw T. Vasculitis or fibromuscular dysplasia? Medical Journal of Australia, 2015; 202(2):100-1. Henderson K, Fludder P. Epidural anaesthesia for caesarean section in a patient with severe takayasu’s disease. Br J Anaesth, 1999; 83:956-9.